Summerhouse Indian Art happened when Carol and Allan Hayes became so immersed in collecting the art and culture of the Southwest that they wrote books about it. CAROL HAYES (1933–2018) opened Summerhouse Antiques in 1980 after 20 years of studying general antiques. Once she traveled in Arizona and New Mexico, Summerhouse evolved. In the late 1990s, after the first book came out, Summerhouse went beyond offering an occasional item of Native American interest and specialized in old and unusual pottery—the Summerhouse Indian Art of today. Carol passed away suddenly in February 2018, but Summerhouse continues as before. 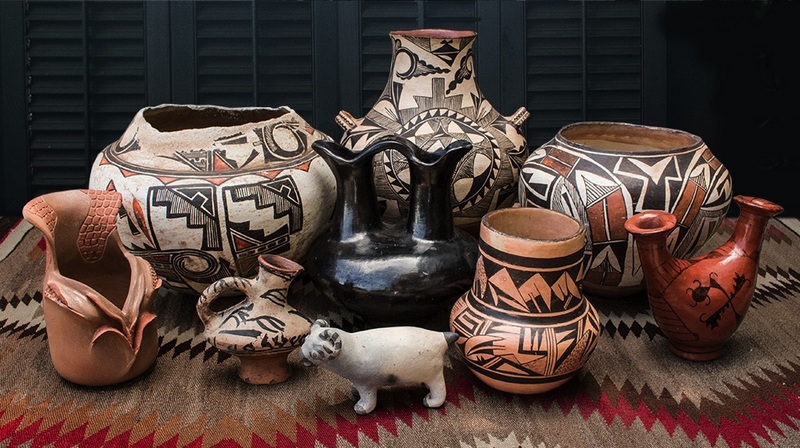 ALLAN HAYES focused on the pottery and, in 1996, wrote Southwestern Pottery, Anasazi to Zuni. Generally recognized as the basic introduction to the art, it remained in print and is now in a revised, expanded Second Edition with Carol as co-author. Another book, Collections of Southwestern Pottery, followed in 1998. In 2006, Allan and Carol wrote The Desert Southwest, Four Thousand Years of Life and Art, a cultural history selected as a Southwestern Book of the Year. Yet another book, their 2012 Pottery of the Southwest gives the history of the art in a small package. Today, the collecting continues and, as it was while Carol was alive, each item will be personally selected, watching always for the old and unusual. We're full members of ATADA, The Antique Tribal Arts Dealers Association, an organization dedicated to providing education for the public and to setting standards for the trade. As ATADA members, we guarantee that whatever we sell is as represented regarding age, authenticity and extent of restoration.